Russia in Europe, Sweden and Norway. Map of Denmark. Map of Holland and Belgium. 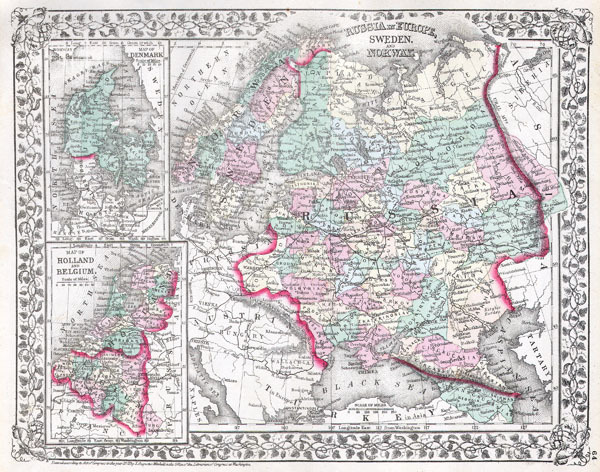 A beautiful example of the legendary American map publisher Samuel Augustus Mitchell Jr.'s 1872 map of Russia, Norway, Sweden, Holland Belgium and Denmark. Maps of Denmark, Holland and Belgium relegated to insets on the left hand side of the sheet. The larger map covers Scandinavia and the european portion of Russia from the Arctic Ocean to Turkey, including the european portions of Russia as well as Finland, Ukraine, Latvia, Lithuania and estonia. Denmark is covered in full, from the Skagerrak to the Baltic Sea. Holland and Belgium are covered from the North Sea to France. Russia at this time was under the suzerainty of Tzar Alexander the II. Alexander is best known for his liberal reforms including the emancipation Reform of 1861. The Reform, considered to be the most important event in 19th century Russian history, liberated Russia's countless serfs. In 1830, the Belgian Revolution led to the secession of Belgium from the United Kingdom of Netherlands into the independent Kingdom of Belgium. Though Belgium had successfully made itself independent, the Netherlands refused to recognize the new country until the 1839 Treaty of London. Meanwhile Scandinavia and Denmark at the time were in the midst of a prolonged period of peace and prosperity that led to a cultural and economic boom.